Pam and I have selected Advanced RV to build our Class B motorhome. I recall several admonitions in these fora to make your last (i.e. ultimate) motorhome purchase first. I want to say thank you to Davydd for his extensive contributions to the class B discussions. These and the contributions of Diamondsea and many others have provided us, I think, the information to follow that sage advice. Can you believe that there is almost a 1 year wait list for an Advanced RV? Much of that time is the delivery delay on the chassis from Mercedes. Pam and I decided to do AVR a "favor" and take one of their 2013 chassis off of their hands. You may have seen a picture of it on the AVR web site: originally dubbed "Marta", it had undergone some initial customization work and so was ready to work into the production schedule. Even before we met up with Advanced RV, my wife had given the motorhome we were going to buy a name: "Imagine" ... as in "Imagine Mike and Pam with an RV". It will be an "out of the box" experience for us. So, it was very easy for us to provide Mike & Brittany of AVR the name they should use to refer to our new bundle of joy. Davydd, your description of how you and your wife travel meshes so well with how we travel, that just about everything you have contributed to these fora has made our decisions that much easier. Again, thank you. Brittany tells us we may take delivery as early as the end of this year! A 2014 Ocean One MB Sprinter by Advanced RV named "Imagine"
You're welcome Mike. Imagine that. You are ahead of me now. We tentatively will take delivery January 14th. I don't know if I ever subscribed to make your last motorhome purchase first since I am on my third try. I guess I did do my homework pretty thoroughly each time and looking back on my purchases I felt and still feel I made the best possible purchase from what was available that would fit my desires best. It was after having them I continued with experience to develop new desires that neither B I had could fix. I do notice that when buying from dealers you are getting what is available. Either what the dealer has or what can be ordered from a standard package and options. That works to a point but then you compensate and justify your purchase and then learn best how to live with it. That's where Advanced RV came in. They still have a basic layout plan, and they still build only off the Sprinter, so you could say they have restraints like everyone else. But they do go farther in working with you to customize what you desire. You then don't have to buy things you know you will rip out once you take possession or make your own upgrades to get things to work to your expectations. 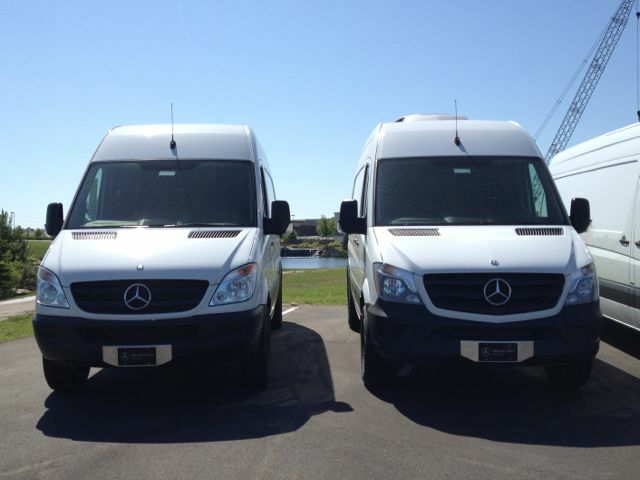 You can order your Sprinter with any option you desire and any exterior color finish M-B offers. You can get any interior finishes you desire. You can make your own godawful picks or you could hire a professional interior designer as you have that much leeway. One thing that strikes you right off when you visit Advanced RV is that on the line there are generally no two RVs remotely alike in layout, features and finish. The first Advanced RV built on spec and sold was completely remodeled by the buyer before it left the factory. There was one B there at Advanced Fest with a music system probably unlike anything ever put in a Class B or any RV for that matter. There was the RV with the two unique under bed dog kennels. Bob (DiamondSea) had his own executive desk built in along with a central vacuum cleaner system. The first AB Air Suspension system was installed. Lithium Ion batteries that Roadtrek Etrek never got out the door were normal. And on and on in just the first 20 vans out the door. Sportsmobile does some of that but you work with a kit of parts that looks exactly like a kit of parts and when you analyze their offerings they are really not much different than anyone else in constraint of offerings, but they do let you come up with your own godawful layouts. In effect I could not come close to what I am getting from Advanced RV if I went through Sportsmobile or anyone else. OK, enough of the commercial. If you want anymore, go to Facebook and search the "B"ing in an Advanced RV group. Yours might have been farther along in prep and we are still designing and working out some details in ours. Our chassis arrived September 11 which was actually about a month earlier than I expected since it was a 2015 model. 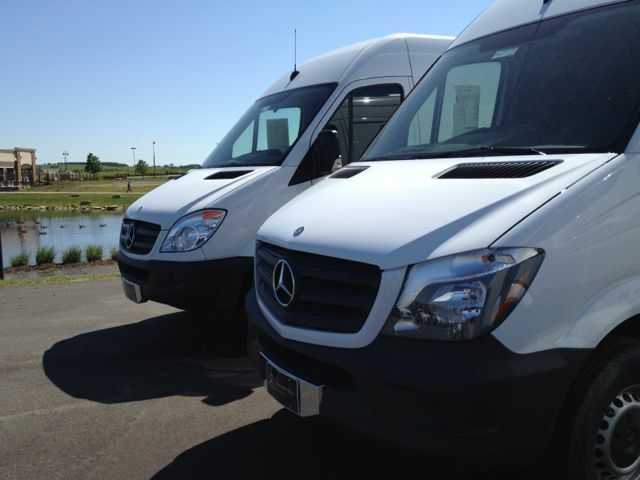 I couldn't see much difference if any from the 2014 Sprinter but there might be some subtle "under the hood" changes and hopefully improvements. I ordered a 2015 because I heard rumors the exterior lights were going to LED but I don't think that happened. I asked Mike N what the big differences were between 2013 and 2015 and his reply was that they were basically around the safety automation. With the after market safety gadgets AVR will be installing, I think the 2013 will be pretty close to "current state". The thing that intrigues me is the Mobile Eye collision avoidance system. I don't think I'll be getting the blind spot warning; but the guys that developed Mobile Eye in Israel are showing some pretty intriguing stuff. They have the car driving autonomously without all the obvious external cameras I saw with the Google concept. There were some cosmetic changes in the front grille, hood and headlights between 2013 and 2014. I believe the steering wheel changed too but I am not convinced for the better in appearance. Mike47, I hope your 2013 MB chassis has the "blind spot assist" device. It's standard as of 2014, and evidently was on some 2013's -- not sure of which. In my opinion it is the biggest advance in RV driving safety in many years. The "Lane assist" part is just annoying -- alarms every time you touch the white line on the right -- so my routine is to turn it off immediately after startup. But after driving a Class A for the past 7 years, it's incredible how much the Blind Spot Assist makes the driving experience better. Mike welcome to the Advanced RV family. My RV "Beans" is awaiting chassis delivery (expected in December) and I expect to take final delivery in April... right around Advancedfest time. My experience with Advanced RV has been very close to Davydd's. I have had the pleasure of challenging the Advanced crew to trying to design around a couple of my ideas and they have done a good job of stepping up to the challenge. My unit will be the first unit they produce with a composting toilet. I've also challenged them to work out how I can have a bench seat behind the driver's seat (travel seat for the dogs) that can convert into a working/eating area when camping. Working with Advanced has been very enjoyable. Advanced Fest 2 might grow to be too big for us all to park behind the building as we did last May. We all pretty much boondocked over 2-3 nights. One person connected up to a 15v plug in the building. Aeronie, Tell us more about the composting toilet and how it will work. Aeronie, I suspect your request was the spark for the latest ARV video. I thought they did a decent job discussing the 3 approaches for dealing with human waste. But one commenter was very harsh in criticizing ARV's coverage. Sounds like you are setting yourself up for some disassembly / reassembly work down the road. I will be interested to see what the ARV solution looks like.